Cover work area with plastic table cover or newspaper and have paper towels handy to protect against any possible spills. 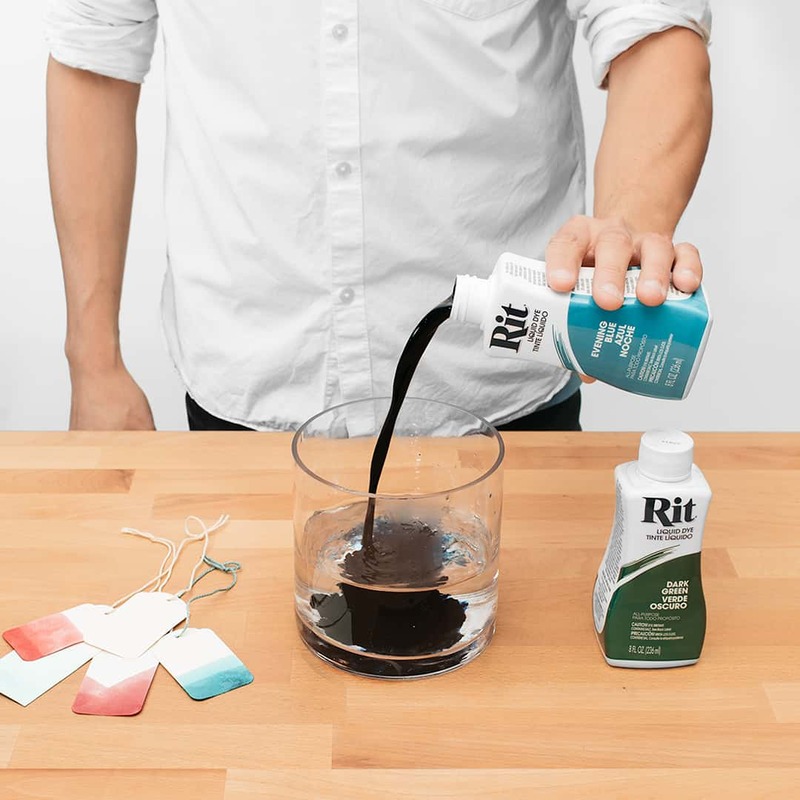 Wearing rubber gloves, mix 1 to 2 tablespoons of well-shaken Rit All-Purpose Liquid Dye or 2 teaspoons of Rit All-Purpose Powder Dye with 1 cup of very hot tap water. You can use a small glass bowl or even a Mason jar for your dyebath. 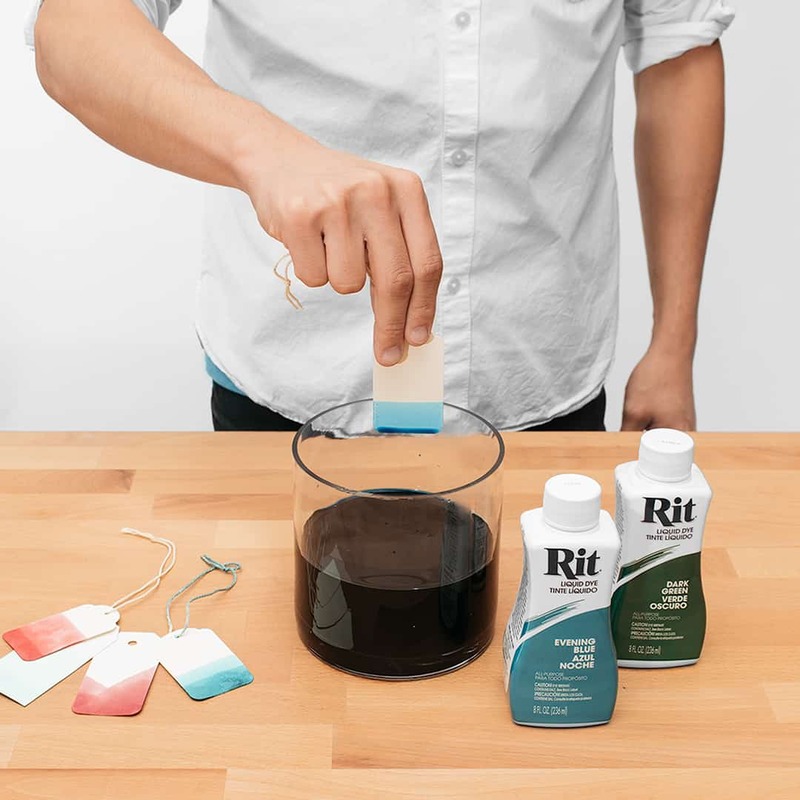 Using a spare piece of paper, test the color by dipping it directly into the dyebath. 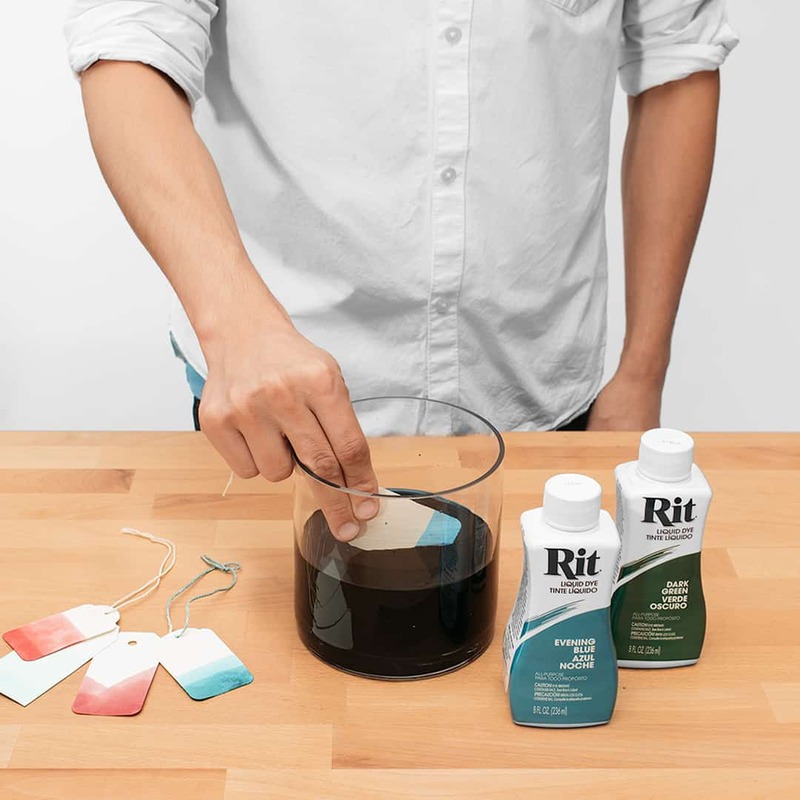 If the color is too light, add more dye; if it is too dark, add more water. Dip paper directly into the dyebath. It will dye within a few seconds. Important Note: Do not keep paper in dyebath for too long. It could warp the paper. If you are looking to achieve a dip dye or ombré effect, dip the paper in quickly and then pull it out slowly, allowing the bottom portions of the paper to spend a few more seconds in the dye to achieve an ombré effect. The longer the paper stays in the dye, the darker it will be. A few extra seconds should be sufficient. To create a batik-dyed effect, stamp, stencil or brush a resist medium, such as Crafter’s Pick Batik-EZ™ Resist Medium, onto watercolor paper before applying dye. Let the resist dry. Spray, drip, drizzle or brush the dye solution over the entire piece of paper using a spray bottle, Preval Sprayer or brush. Or you can dip dye the paper by dipping part of it into the dyebath. Place dyed paper with resist medium in the microwave for 30 to 60 seconds. This helps the dye bond to the paper and dries the resist. Then rinse the paper under running water and use a sea sponge to remove the resist medium and excess dye. To achieve consistent results, make sure the dye stays hot. This is especially an issue if you are doing a large project with a lot of paper. Dye can be reheated in the microwave for 1 to 2 minutes. Remove paper from the dyebath and blot it with a clean paper towel to remove excess dye. Lay paper out flat on clean dry paper towels until completely dry. To help bond the dye to the paper and prevent bleeding if the paper gets wet, you can place it in on paper towels in the microwave for 30 to 60 seconds.